Last Saturday night, John and I were out for our usual date night at Terilli's - a neighborhood favorite of ours that is a perfect walk in the beautiful Dallas Spring weather. We took our spot at the bar, and both of us were immediately drawn to the woman next to us. 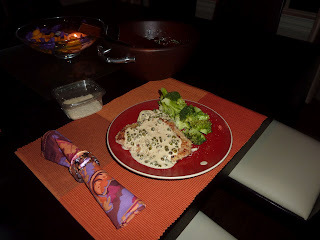 What ensued next is sort of embarrassing, in a 'we are too obsessed with food' sort of way, but we got the information we needed: the lady was eating Veal Piccata. 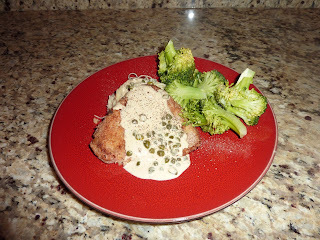 I have to admit I've never been particularly interested in Veal Piccata, but I don't know why. Oh wait - I do know why. Because when I was in grade school my parents went through a phase where they ordered so much veal from the meat man that it filled up our entire freezer and refrigerator, and even when we ate it every night for months it seemed we always had more. In fact, I think I need to revisit the veal situation with my parents. It seems even weirder the older I get. Why mom and dad, why so much veal? Anyway, the lady at Terilli's was eating an extraordinarily good-looking meal, so good that it inspired us to eat it for our Sunday night dinner. 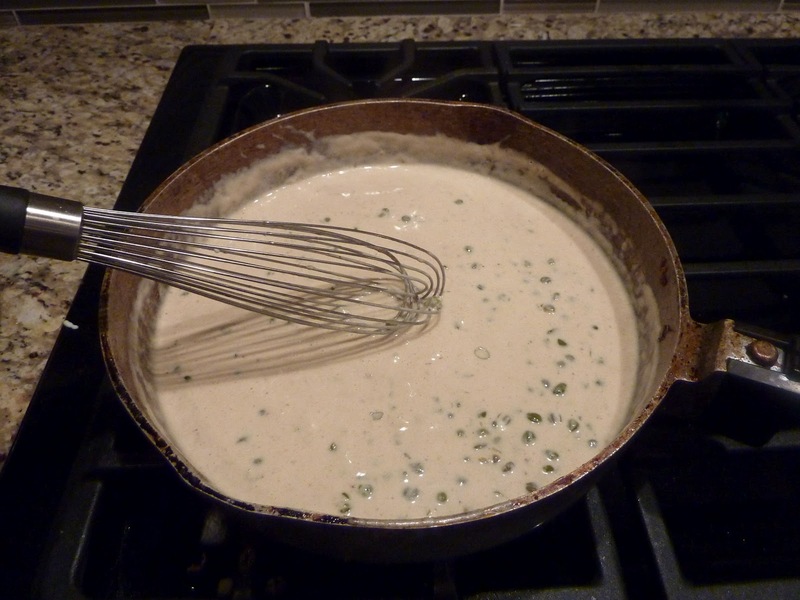 Conveniently, my co-worker Andy Papp - who seems to share my same appreciation for food (and gum...thanks Andy) - had been buttering me up with this caper sauce recipe he had. We talked about it in depth several times, and he was so passionate about it that I was sure I needed to make it at some point. "You can put it on anything," was his claim. Well, Veal Piccata, you are a perfect candidate. 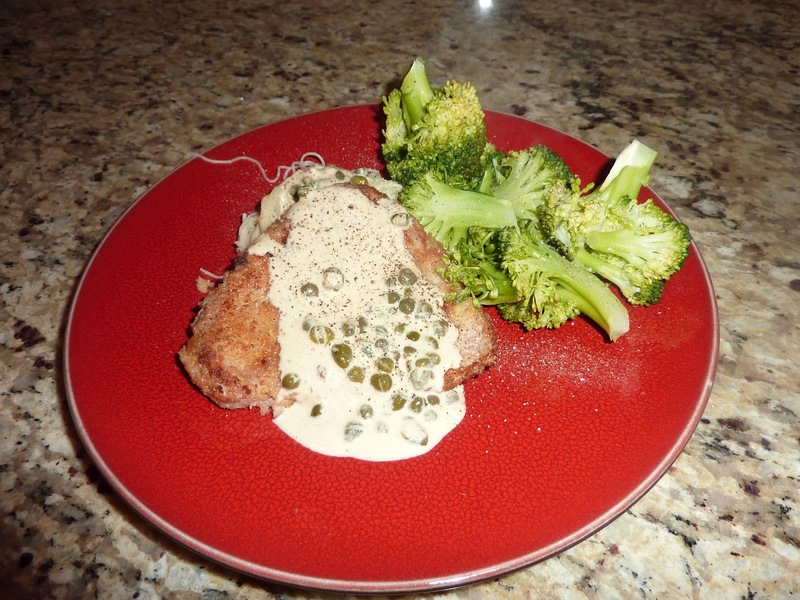 And actually, Veal Piccata might technically include the standard caper-lemon-butter sauce....but just consider this an amped up version, better and heartier than the original. Start by making the veal. Heat about 2 tablespoons olive oil and 1 tablespoon butter in a skillet. Place the flour, egg, and breadcrumbs in three separate bowls. Pound the veal to about 1/2-inch thickness, sprinkle with S&P, then dip first in the flour, then the egg, then the breadcrumbs to coat. Place the veal in the heated skillet, and pan fry for about 2-3 minutes on each side. The veal is thin and it won't take long to cook through. Transfer it to a plate. Without cleaning the pan (the meat drippings are crucial, according to Andy! ), add in the butter for the sauce. Let it melt, then add the mustard and capers. Bring the mixture to a low boil, then add the wine. Let it reduce for about 5-10 minutes over medium heat. Add the remaining ingredients, and whisk to combine. Continue stirring over medium heat until the desired thickness is reached....I think I did about 10 minutes. While you are doing this, it would be a good idea to cook the pasta. Angel hair is very fast, so you can always do it at the end. Top the pasta with the veal, then pour the sauce (generously!) over it. If you have vegetables as a side, keep going - Andy's right - this sauce is good on EVERYTHING. I'm officially back on the veal bandwagon, and also the caper sauce bandwagon if one exists. Whatever happened as a child, it's time to let it go. And I have the random lady at Terilli's to thank for it. And Andy, for this amazing and versatile sauce. Plus, it looks sort of fancy. I like fancy.